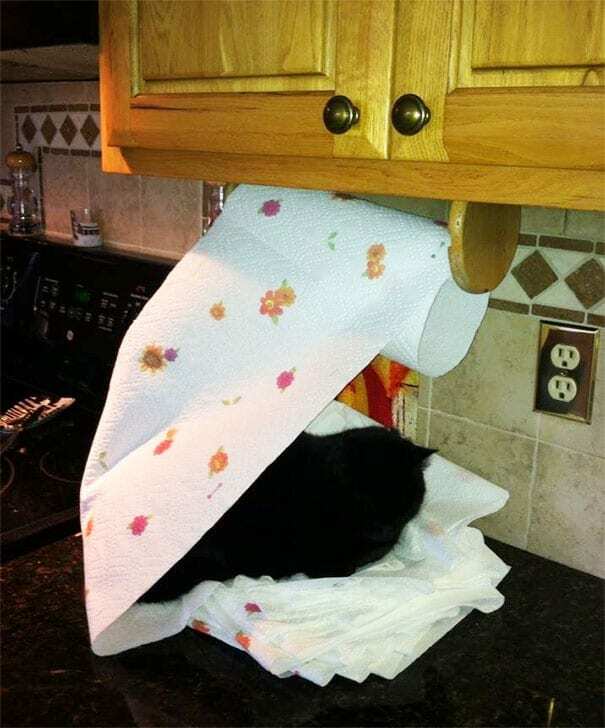 When their humans are out and about, pets can sometimes get into mischief. The pets may visit a part of the house that’s usually forbidden, or they may simply play a little rougher with each other than usual. Sometimes, pets will be able to get away with their misbehaving, but other times, their humans catch them! 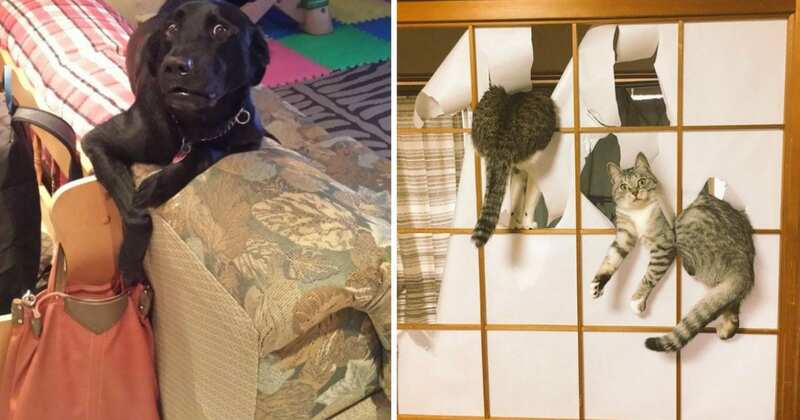 We’ve collected hilarious photos of pets who were caught getting into trouble. This includes photos of pets ending up in surprising places and pets getting a little destructive in their houses. These owners couldn’t help but laugh when they saw what their pets were up to when they were away. If you’re in need of a good laugh today, check out these photos of adorably naughty pets! These photos are guaranteed to make you smile. This adorable dog decided to sample her mom’s makeup collection while she was out of the house. 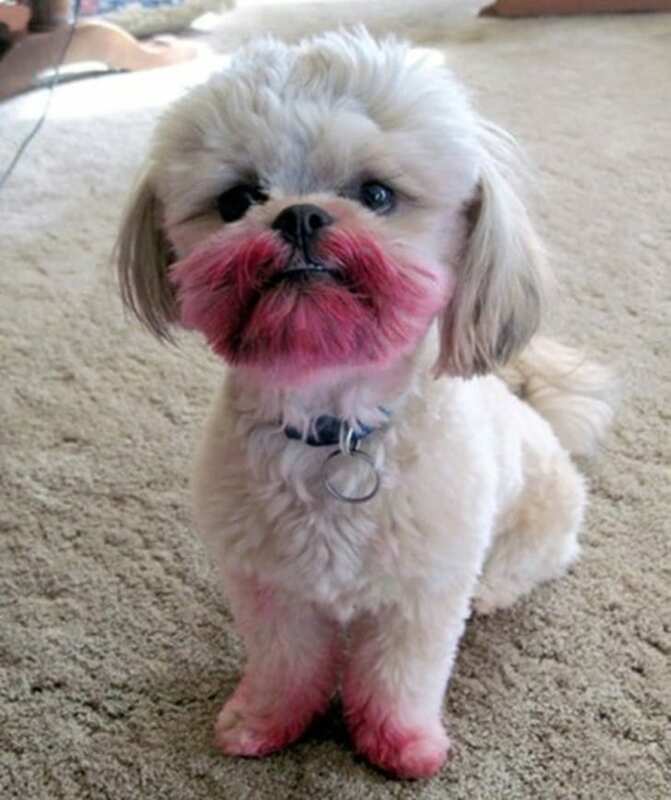 Since it was her first time wearing lipstick, she ended up putting a little too much on. We still think she looks beautiful, though. 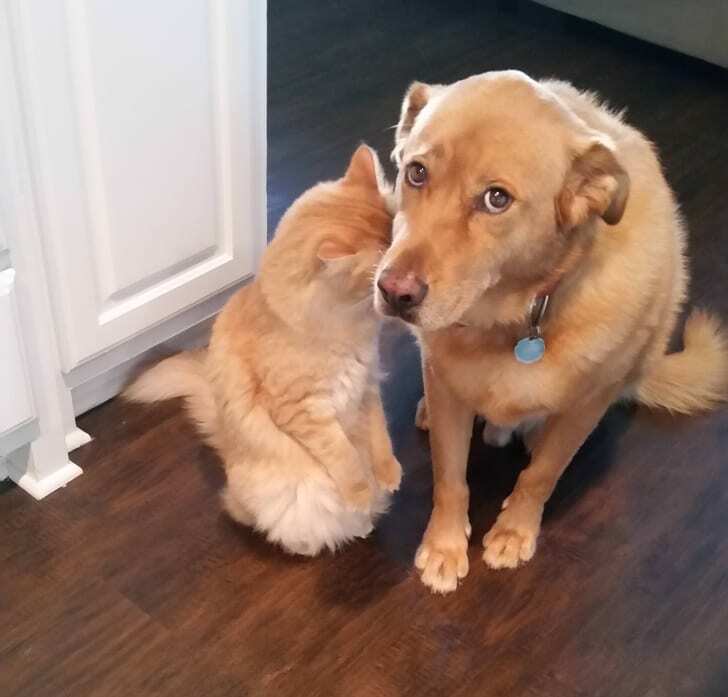 These cute faces say, “don’t look at me, it was their fault!” We love how both the cat and dog have put on their most angelic faces. 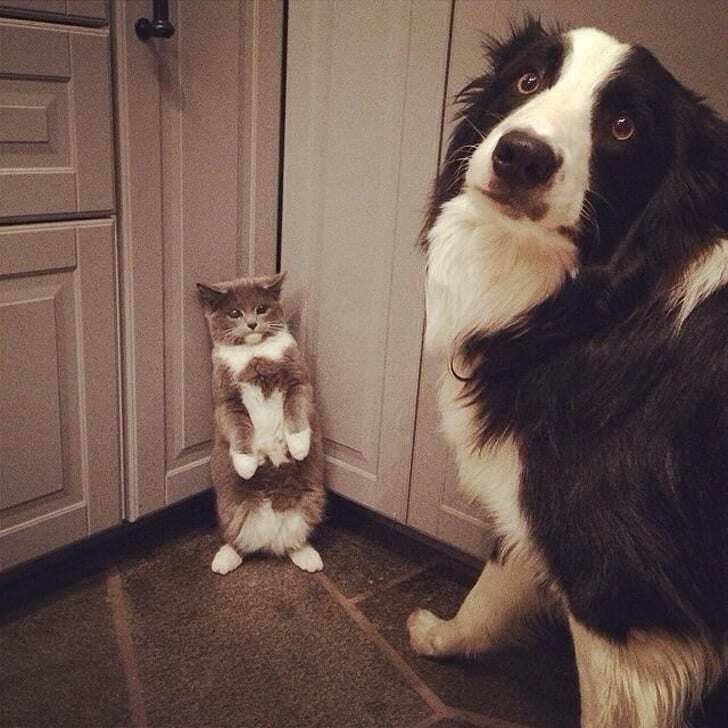 They know that they did something wrong, and they’re hoping to get out of trouble by simply looking adorable. 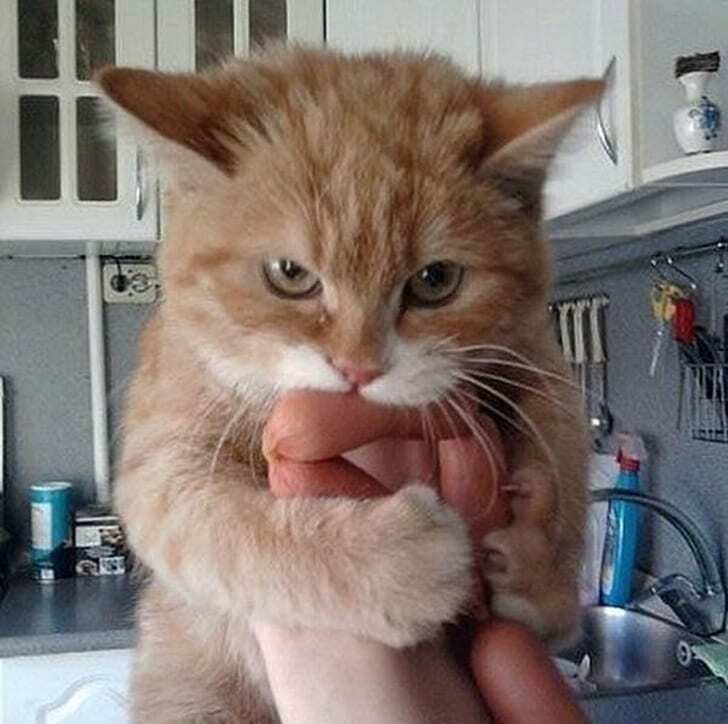 When this cat’s owner was away, she discovered that her human had a huge stash of sausages. 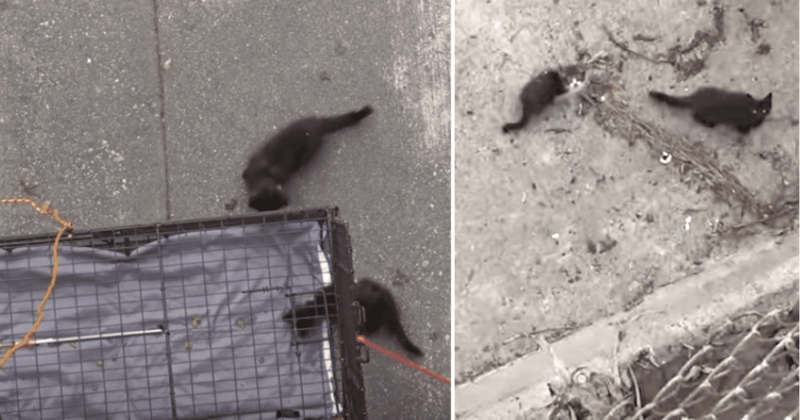 The cat was thrilled by her discovery, but when her owner came home he tried to take them away from her. The cat wasn’t having that, and she held on tight to her treasures. This pup felt like it was time to give her old bed a beautiful makeover. She decided to get creative, and so she headed into the bathroom to find materials to use. While the dog liked her new bed, her owner wasn’t quite as happy with her creation. 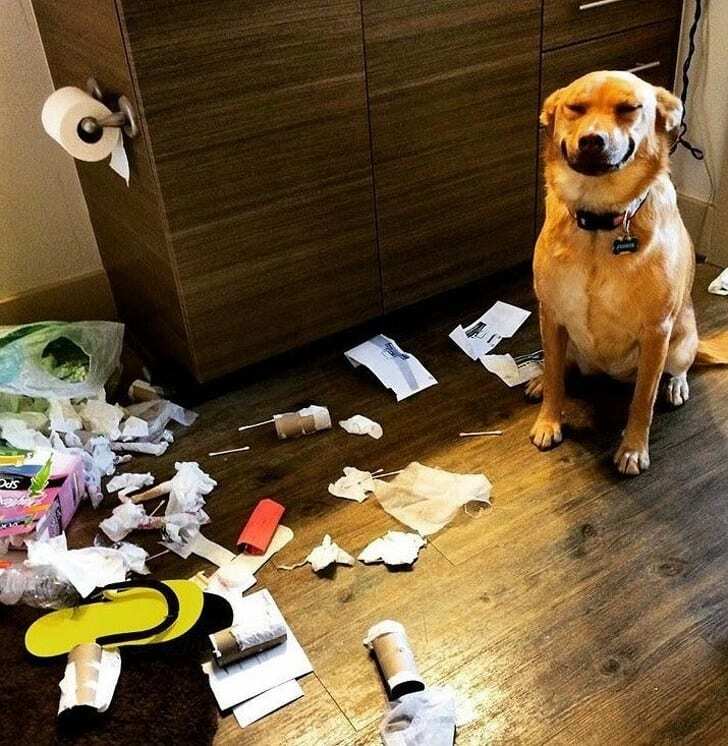 We’re sure this dog is thinking, “If I smile and act innocent, they won’t suspect that I was the one who ate all the trash.” We hope the pup’s strategy works, and if the dog is innocent, we hope that they find the real culprit soon! 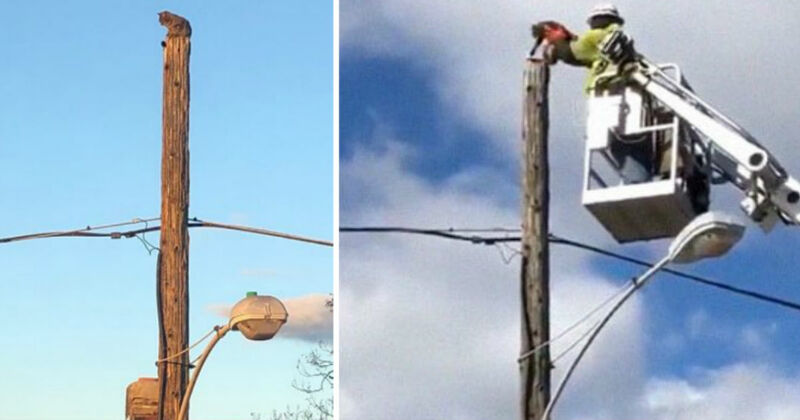 Cats are very good at getting stuck in the most surprising places. 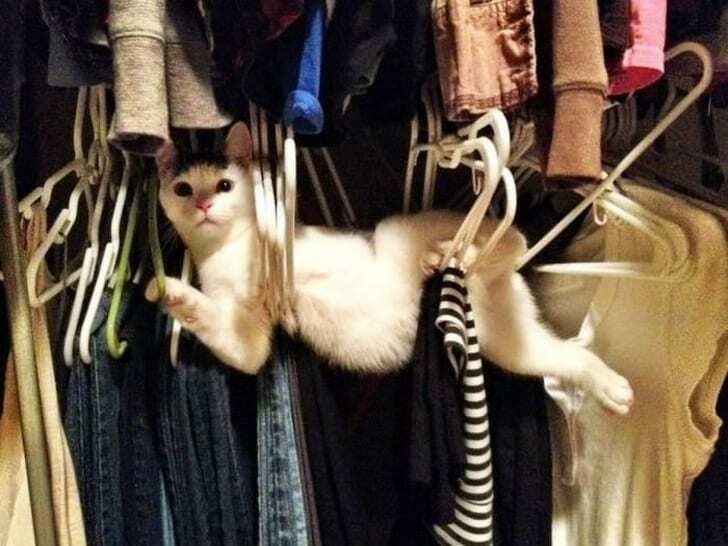 For a great example of this, check out this hilarious photo of a cute kitty who someone managed to crawl into a set of hangers. The cat looks like she’s enjoying hanging around—she has lots of comfortable clothes to sleep on! These animals spent all their time ‘hugging’ while their owner was away. Just look at the pug’s face—that’s the most innocent face we’ve ever seen. 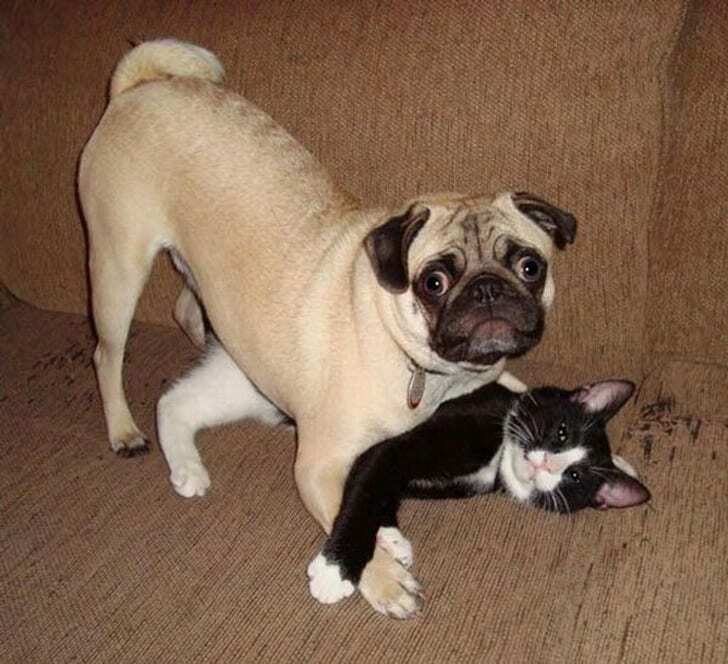 The cat looks a bit more suspicious, so there is a good chance that she’ll tell her owner what she and the pug were really up to. 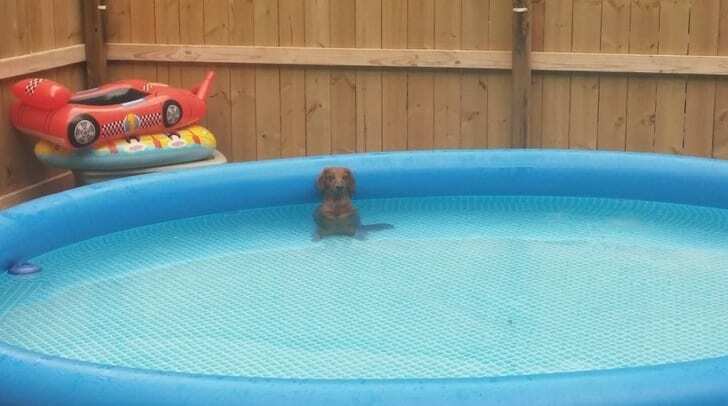 On a hot day, this dog decided he could use a dip in his owner’s pool. The dog headed outside and relaxed in the water. 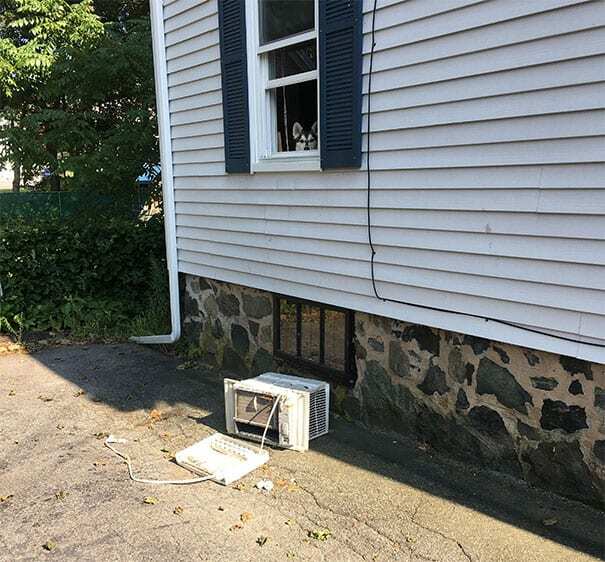 When his owner came home, he couldn’t stop laughing—his pup had found the perfect place to cool down. 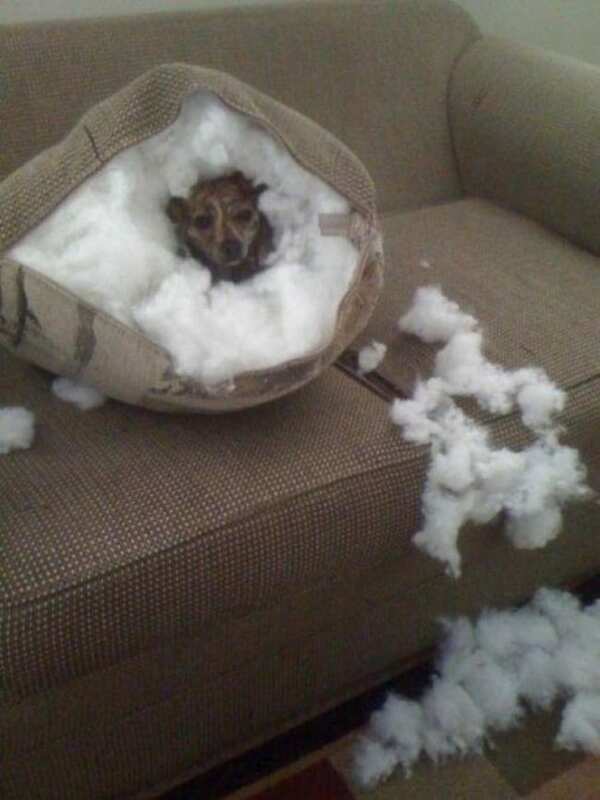 This little dog got cold while his owner was away, and so he came up with a brilliant idea: he climbed inside a pillow! We have to applaud this dog for his creative thinking. His new bed also looks very comfortable—he may have started a new trend. 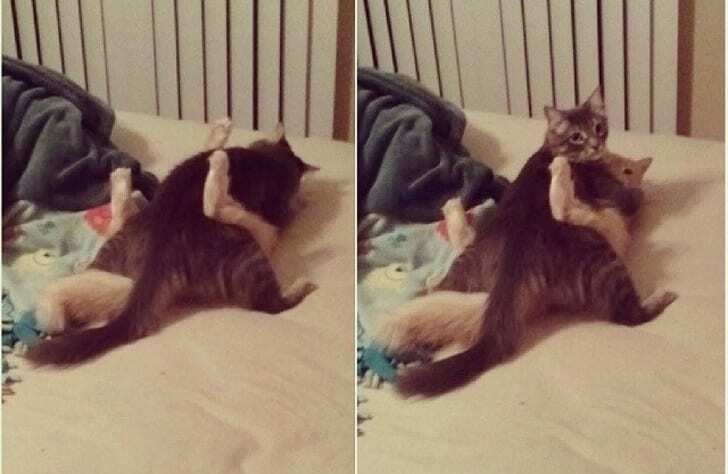 This cat owner was shocked when he came home and found his cats in a compromising position. 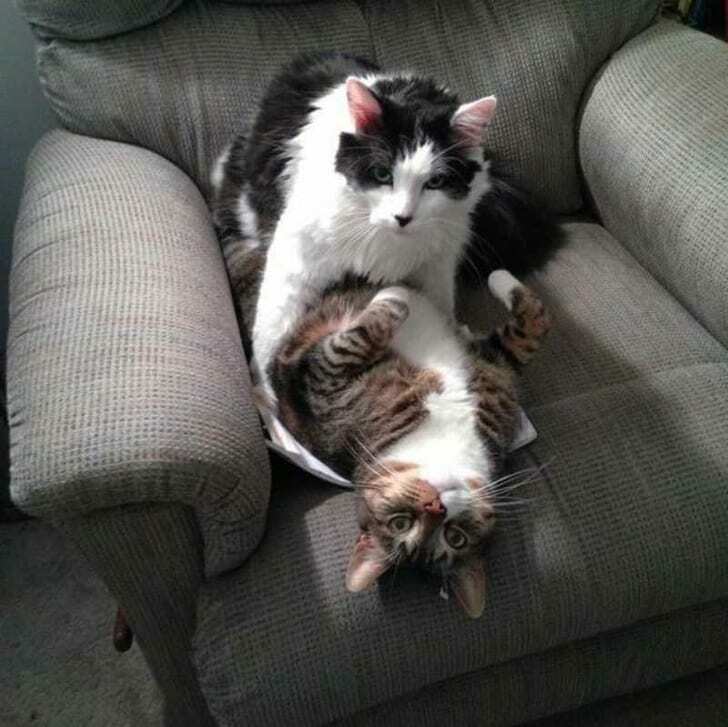 The owner couldn’t help but laugh when he saw how his cats were play-fighting. After this rabbit’s owner left, he hopped right onto the couch. 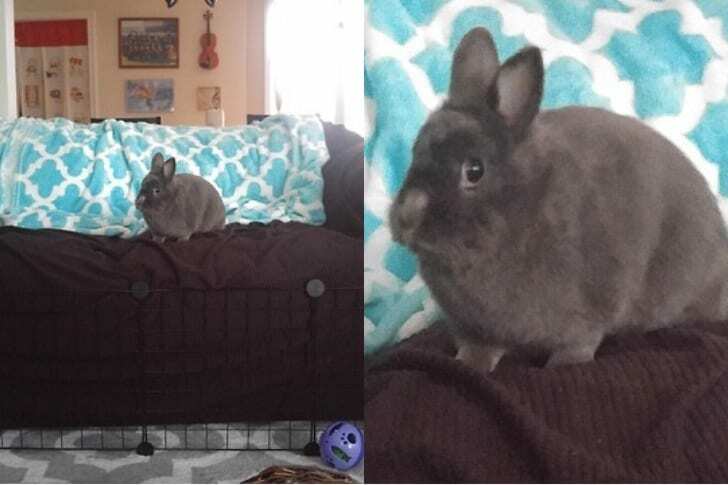 Since the rabbit tends to chew up the furniture, he isn’t usually allowed on the couch. But while his owner was out, he was able to break the rules. 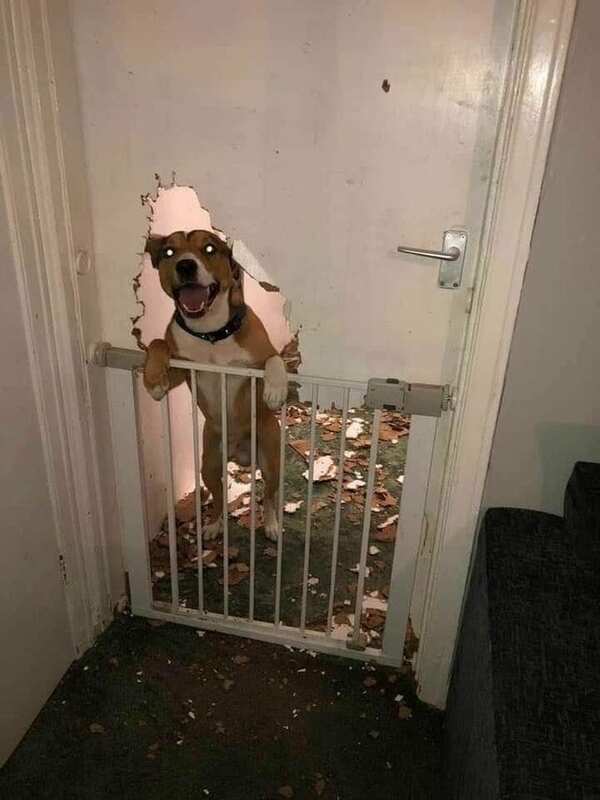 While this dog’s owners were away, he decided to create a brand-new door for them. 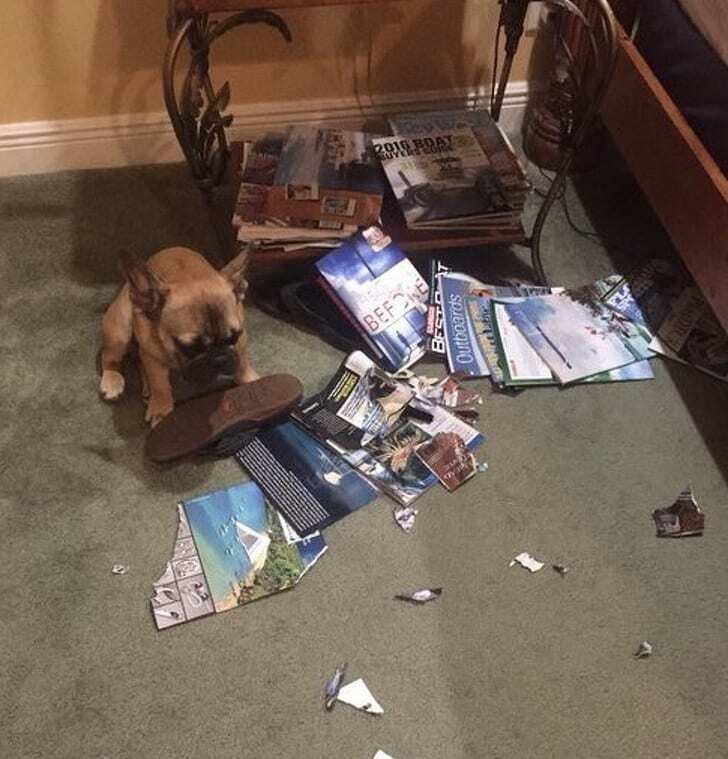 When the pup’s humans got home, he was so excited to show them what he did. He waited for them at the door with the biggest smile on his face. 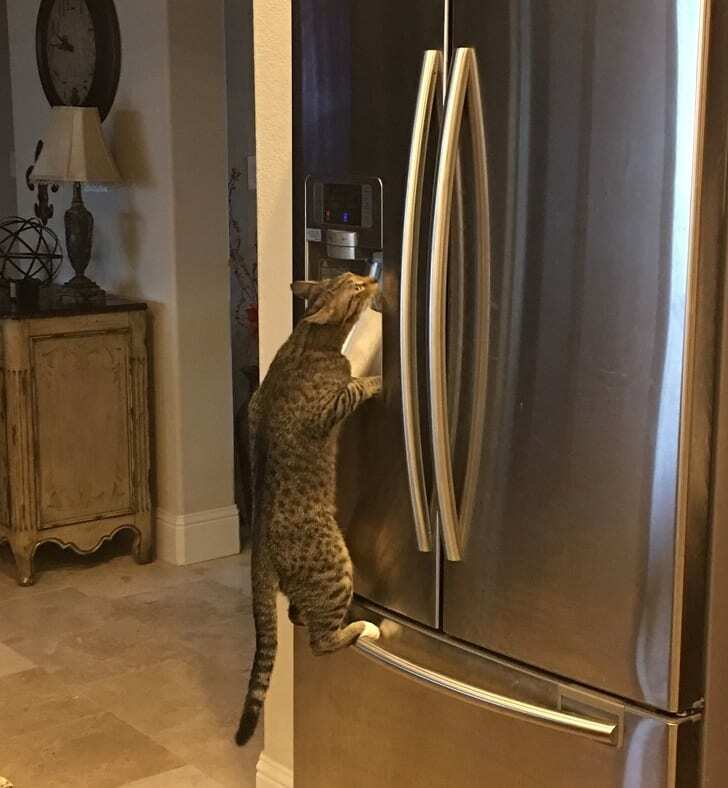 We’re impressed by how clever this cat is, and it’s also clear that the cat knows the importance of keeping hydrated. Sure, his owner left a bowl of water out for him, but the water from the fridge is much colder and fresher. 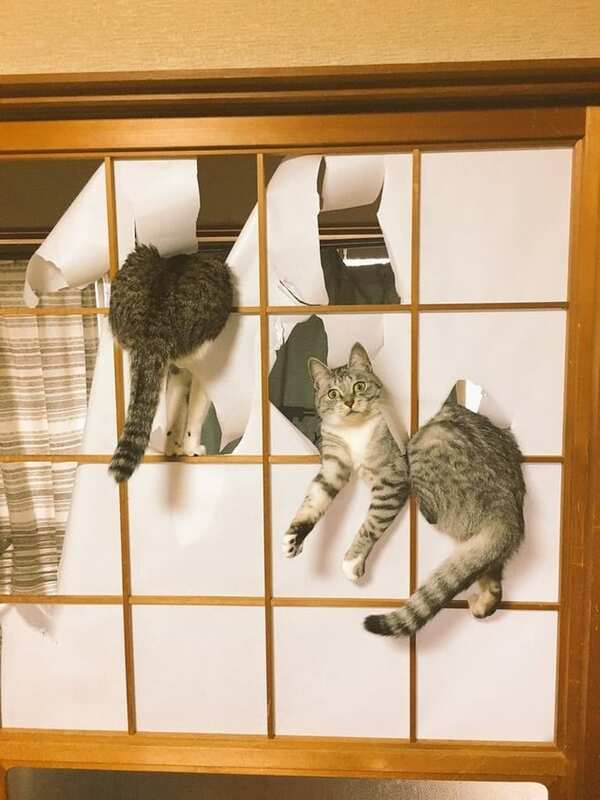 When these cats saw their mom’s new rice paper walls, they couldn’t resist tearing them up. The cats hoped to finish their redecorating before their mom got home, but they weren’t so lucky. Their mom caught them right in the middle of their redecorating project. 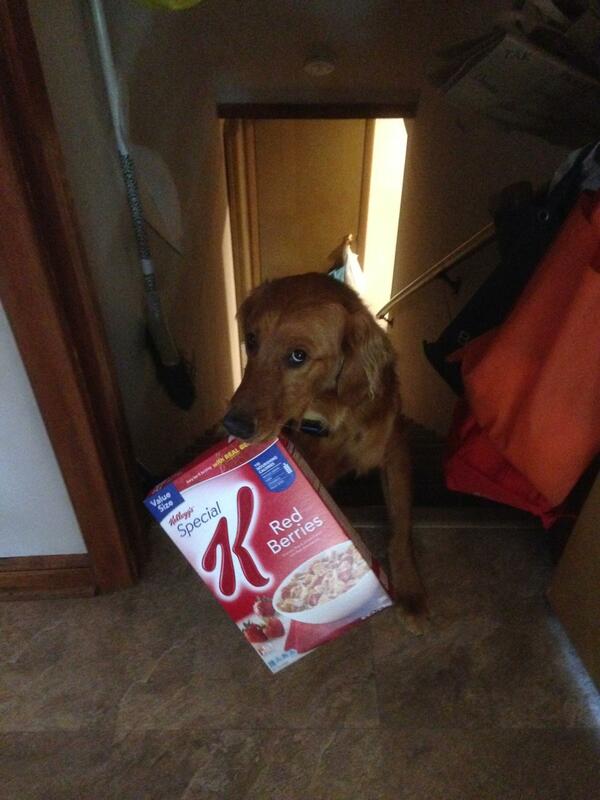 All this cute dog wanted was to tear into a box of cereal while his owner was out, but then his owner came home early. We hope the dog’s owner gave him a few pieces of cereal—it’s clear that the dog wants to try a bit more than anything in the world. This kitty wanted to make her human a special treat in the mixing bowl, but her owner came home too soon. 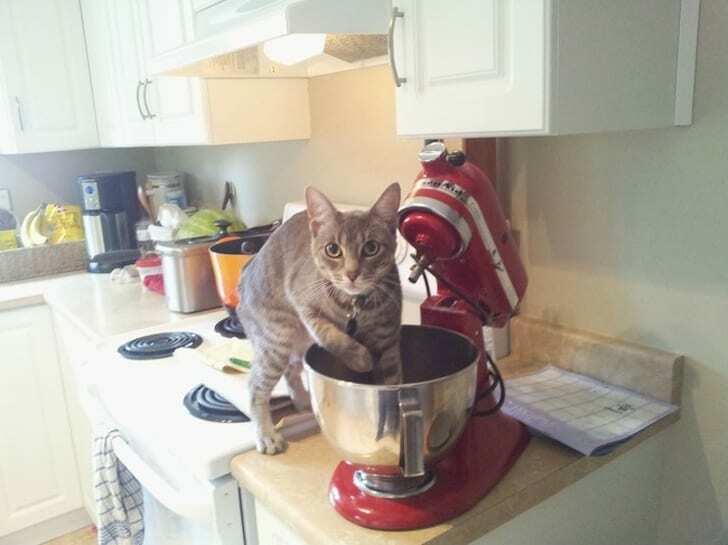 Maybe now the cat and her owner can work together on baking something delicious! 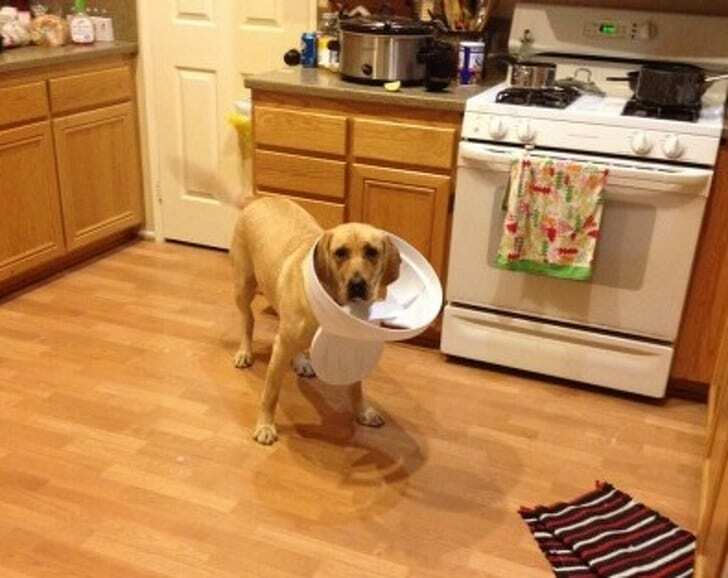 We’re sure this dog tried to convince his owners that he hadn’t gone through the trash can, but the lid around his neck gives him away. The dog probably tried to think of a good excuse for why he was in the trash can—maybe he told his owners that he thought he saw a monster in it. This little puppy was very tempted by the magazines that were right as his eye level. He hoped his owner wouldn’t notice if he just tore up one or two of them. 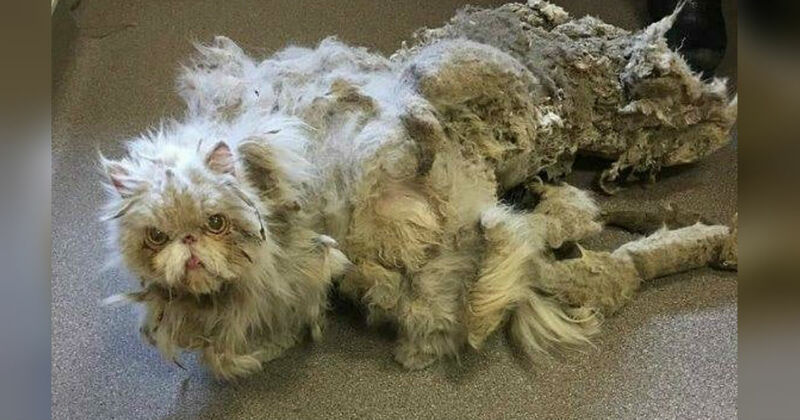 Unfortunately, he got a bit carried away, and his owner wasn’t too happy. The dog gave his owner his best puppy eyes, and all was forgiven. It looks like this dog is trying to hypnotize his owner with his puppy dog eyes. 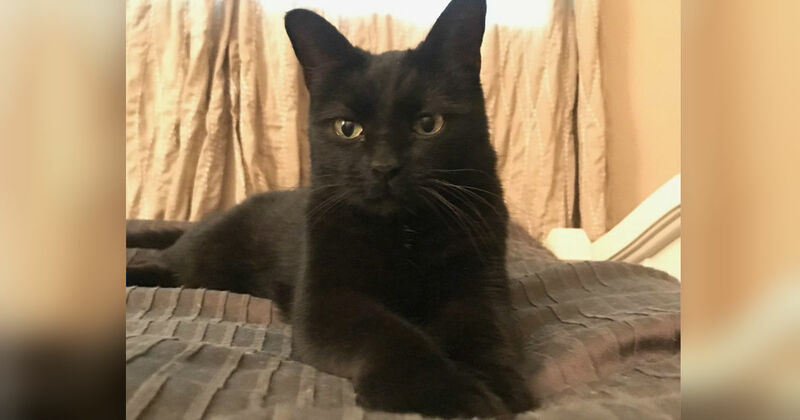 He thinks if he gives his owner a cute enough look, his owner won’t go looking for what he broke. The cat has a different strategy—she’s simply hiding her face and hoping her owner won’t question her. 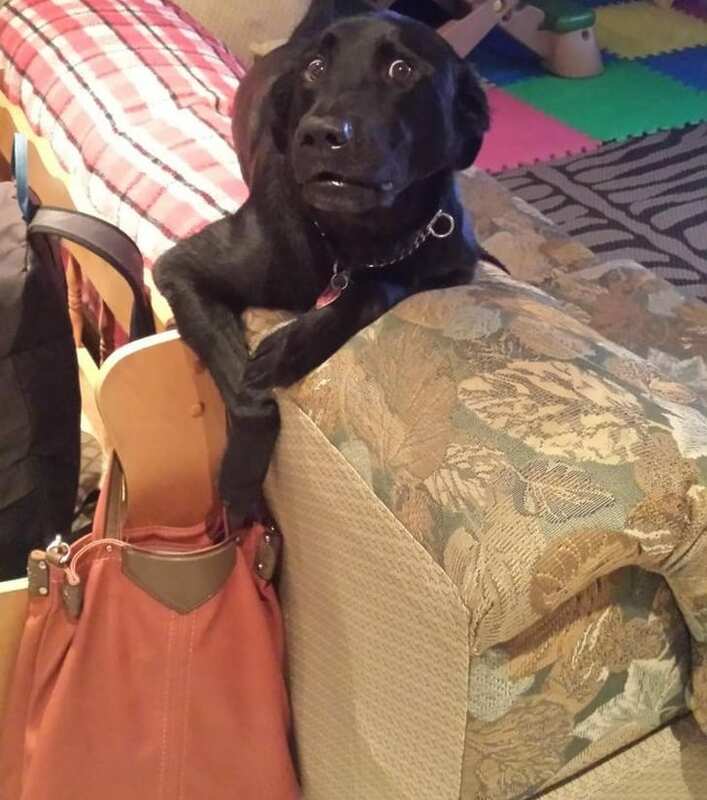 When this pup’s mom was out of the room, he decided to see if she had any treats in her purse. The dog’s human brother caught the dog red-pawed, and as you can see, the pup was shocked. The dog tried to talk his way out of it, but it’s hard to argue with such clear-cut evidence. 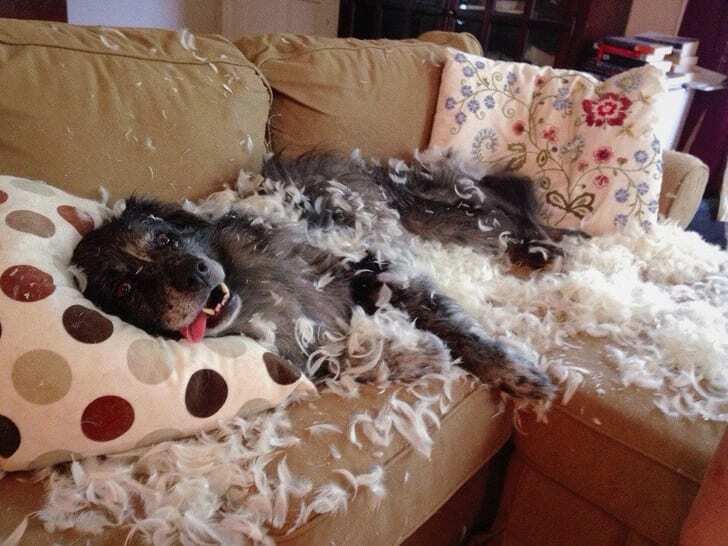 This dog decided he wanted to play with feathers when his owner was out of the house! When the dog’s owner got back, the pup played innocent, but all the feathers around him gave him away. Like any good big sibling, this cat wants to teach his little brother everything he knows. While their human was out, they decided to do some wrestling. Judging by the younger cat’s expression, he isn’t too sure if he likes wrestling yet. 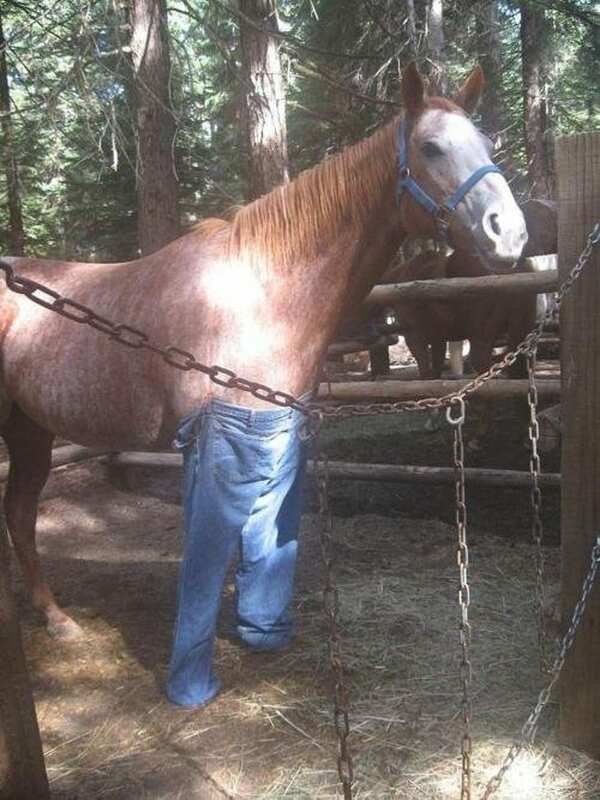 When this horse’s owner was away, the horse decided he wanted to try on a pair of his owner’s jeans. The horse looks great in the jeans—we’re impressed by his fashion sense. 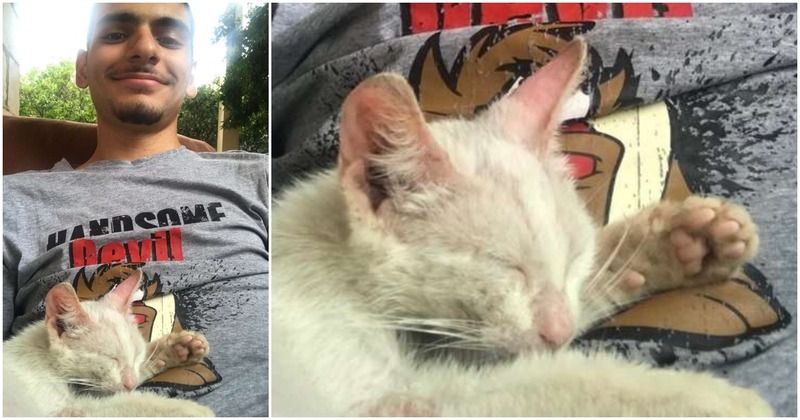 When this cat’s owner arrived home, he looked for his cat everywhere. 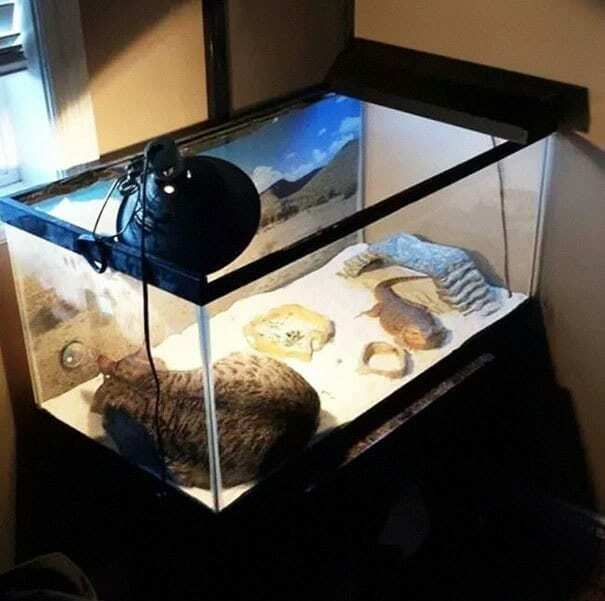 Finally, he found him in the most unexpected place: his lizard’s terrarium. The cat saw the heat lamp and decided that it was the perfect place for him to take a nap. 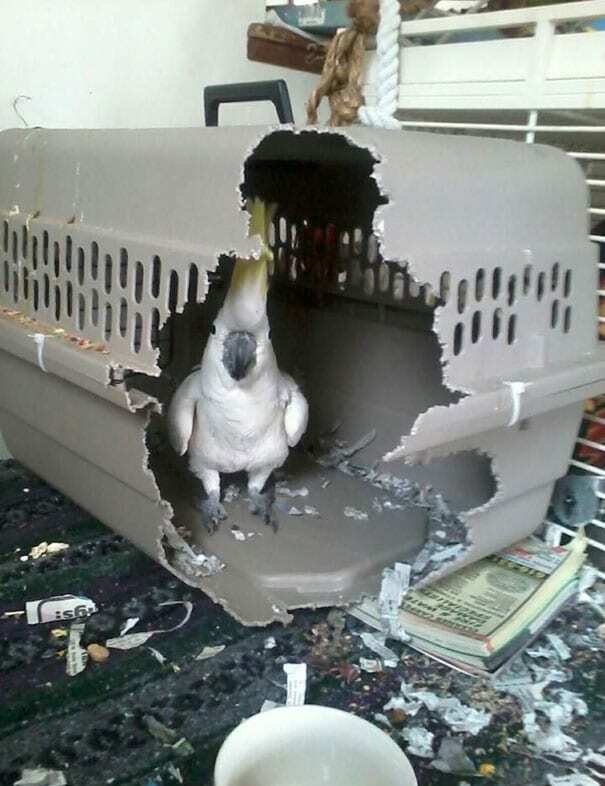 This Cockatiel didn’t enjoy being put in a crate, and she made sure that her owner knew it. We’re sure her owner will think twice before putting her in any more cages in the future. For a moment, this kitten stopped her curtain rampage when she saw her owner was home. But then, the kitten decided to carry on with what she was doing before. She was happy to have an audience! 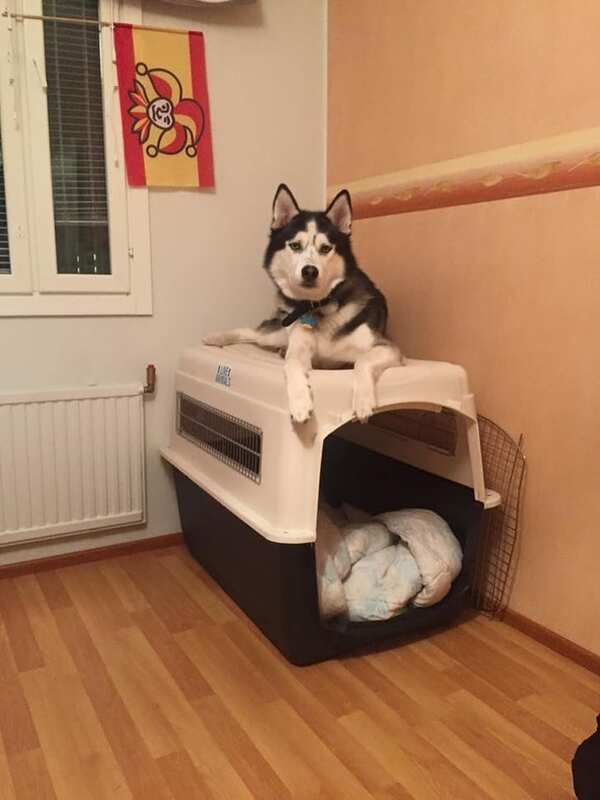 When this Husky’s owner got home, she got a huge shock: her air conditioner had fallen out of the window. At first, she thought it fell naturally, but then she saw her Husky staring at her with big eyes and she realized what actually happened. 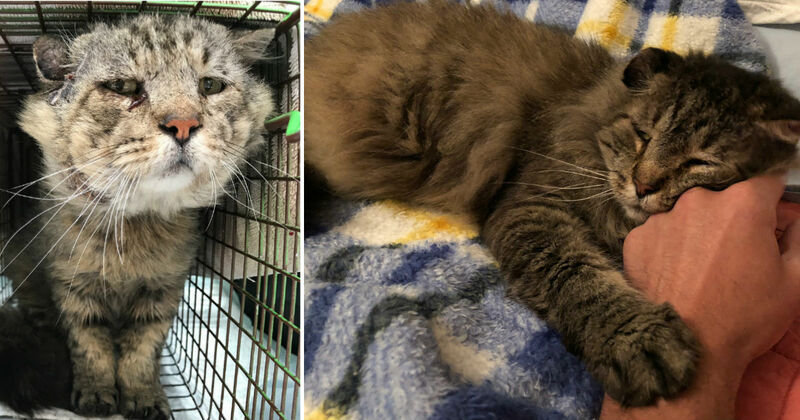 After his owner left, this cat had a dilemma: he wanted to take a nap, but his bed wasn’t feeling very comfortable. And so, he got creative and made a bed out of a roll of paper towels. The cat snoozed happily on his makeshift bed. 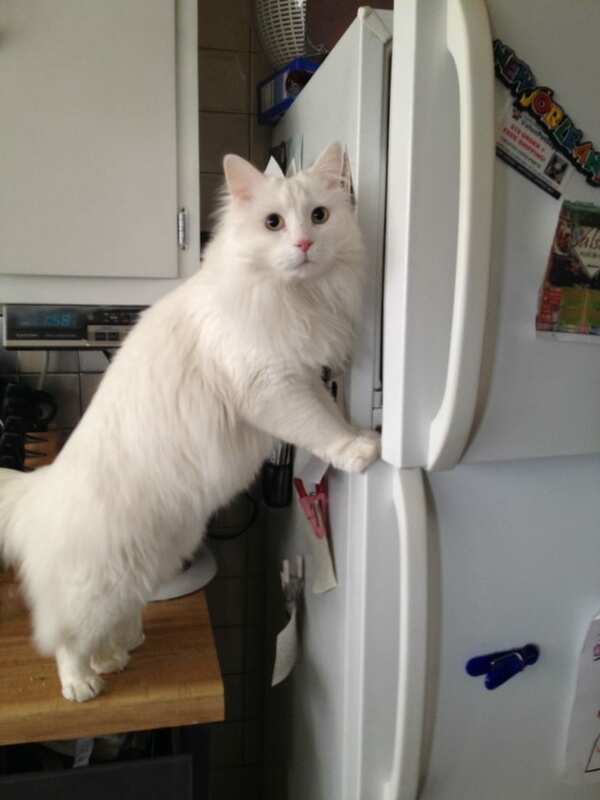 This clever cat figured out how to open the freezer, and she started opening it whenever her owner was away. Unfortunately for the cat, her owner caught her in the act. Just like that, the cat’s freezer opening days were over. 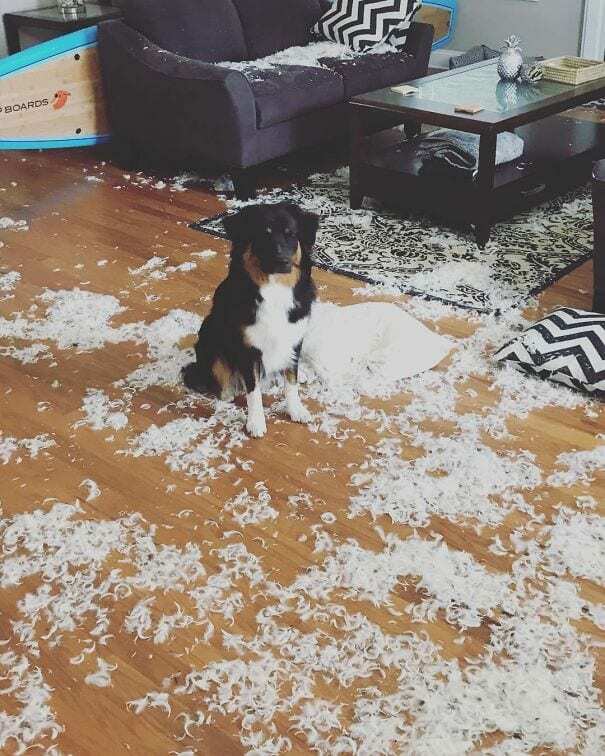 After this woman came home and saw her living room covered in feathers, she naturally had a few questions for her dog. But her dog simply closed his eyes and pretended he didn’t see anything. After all, if he couldn’t see it, it wasn’t real. When this dog’s owner went out, the dog climbed onto a forbidden chair. 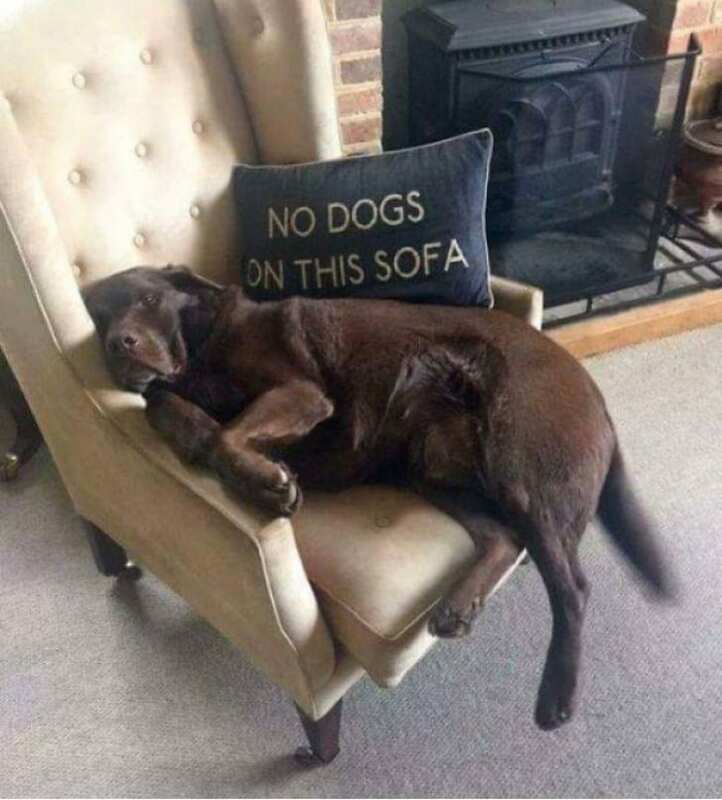 There’s a pillow on the chair telling the pup to stay off, but since dogs can’t read, we can’t blame the dog for not realizing that he wasn’t allowed on the chair. 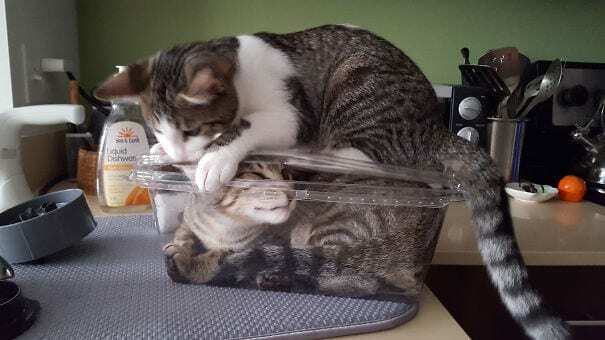 These cat siblings don’t always get along, but one day, one of the cats took things a bit too far. Luckily the cat’s owners came home before the cat got the lid on the box! 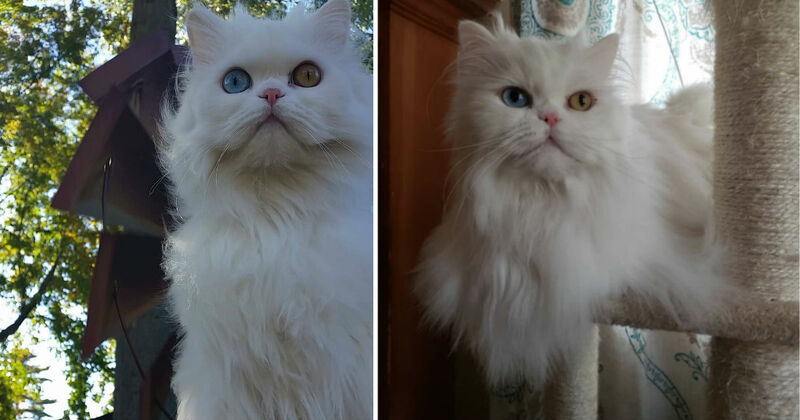 It looks like this cat started worrying about her owner was, and because of that, she decided to create a peephole so she could watch out for her. 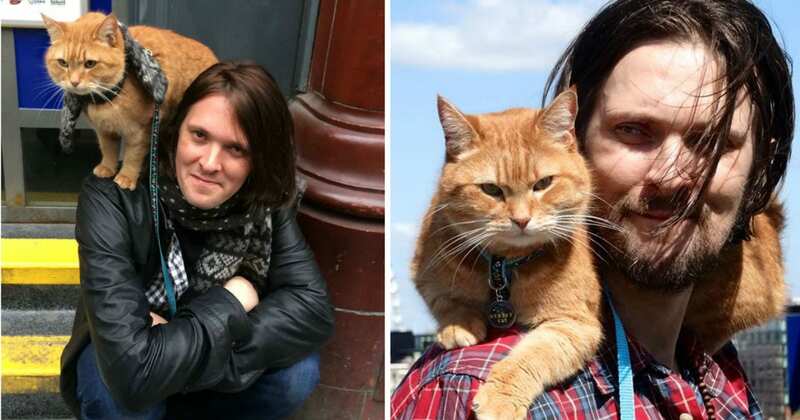 It’s nice to think that this cat was so worried about their owner. 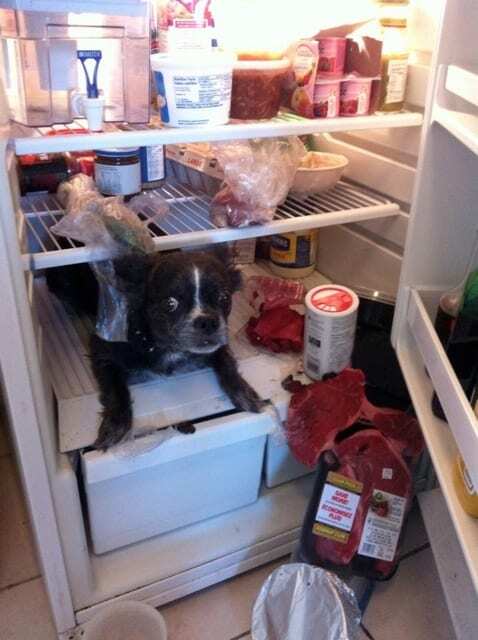 This little dog was feeling a bit warm, and so he decided to cool down a bit in his owner’s fridge. Having easy access to all of his favorite foods was an added bonus! This pup’s owner had to take a photo when he saw where his dog was hiding. 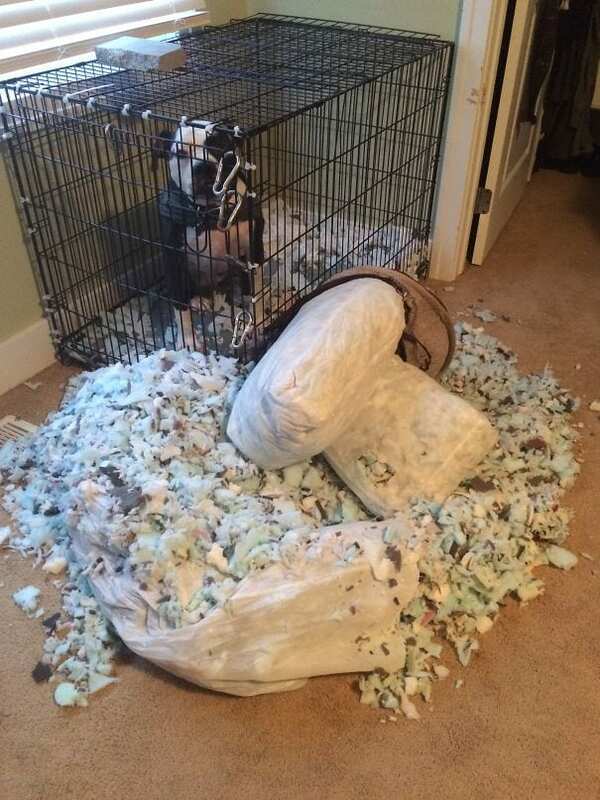 This dog’s owner put their dog in a crate while they were out, but the clever dog still managed to destroy a pillow. 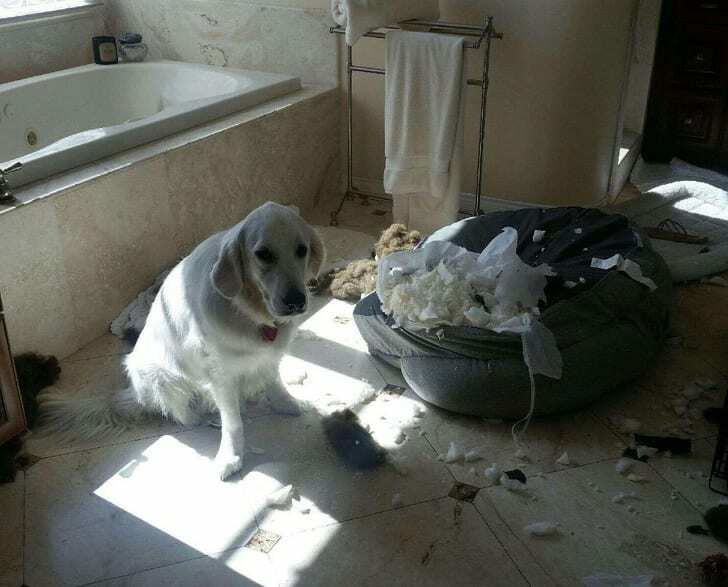 We’re not sure how the dog did this, but one thing is for sure: the pup is dedicated to causing mischief. 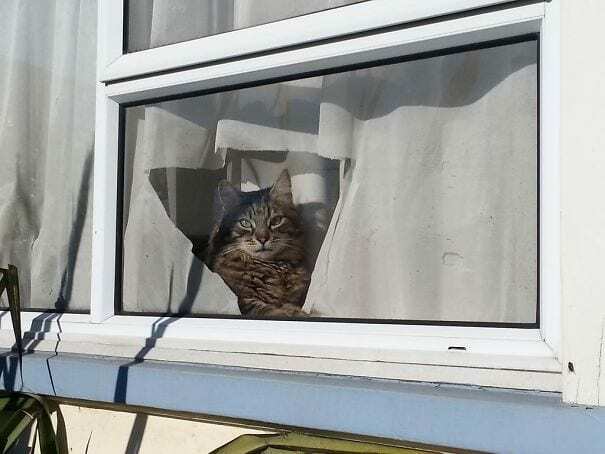 These 36 photos all show hilarious examples of what pets get up to when their owners are away. These funny photos show just how mischievous pets can get when they’re left to their own devices!